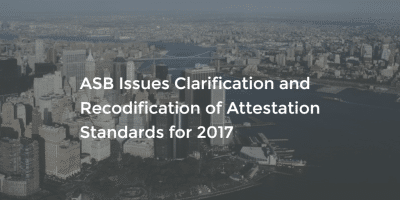 On Tuesday, April 4, 2016, the Auditing Standards Board (ASB) issued Statement on Standards for Attestation Engagements (SSAE) No. 18, Attestation Standards: Clarification and Recodification. SSAE No. 18 establishes requirements for performing and reporting on examination, review, and agreed-upon procedures engagements where practitioners report on subject matter other than historical financial statements (e.g., an entity’s compliance with laws or regulations, the effectiveness of an entity’s controls over the security of a system). SSAE No. 18 also includes requirements and application guidance for prospective financial information, pro forma financial information, compliance attestation, and controls at a service organization relevant to user entities’ internal control over financial reporting. The identifier “AT-C” is used to differentiate the sections of the clarified attestation standards (“AT-C” sections) from the sections of the attestation standards that are superseded by SSAE No. 18 (“AT” sections). SSAE No. 18 restructures the attestation standards so that the applicability of any AT-C section to a particular engagement depends on the level of service provided and the subject matter of the engagement. The applicable requirements for any attestation engagement are contained in at least two AT-C sections: AT-C Section 105, Concepts Common to All Attestation Engagements, and either AT-C Section 205, Examination Engagements; 210, Review Engagements; or 215, Agreed-Upon Procedures Engagements. AT Section 501, An Examination of an Entity’s Internal Control Over Financial Reporting That Is Integrated With an Audit of Financial Statements. (The content of AT Section 501 has been clarified, revised, and issued as a Statement on Auditing Standards (SAS) in SAS No. 130, An Audit of Internal Control Over Financial Reporting That Is Integrated With an Audit of Financial Statements (AU-C Section 940).) The effective date for SAS No. 130 is for integrated audits for periods ending on or after Dec. 15, 2016. AT Section 701, Management’s Discussion and Analysis. This section has not been clarified because practitioners rarely perform these engagements; however, it will be retained in the clarified standards in its current form. SSAE No. 18 is effective for practitioners’ reports dated on or after May 1, 2017. This material will be eligible to be tested in the July 1, 2017 testing window.